The President marries Frances Folsom in the Blue Room. At 21, Frances was the youngest First Lady. This was one of the most unique moments in American history. 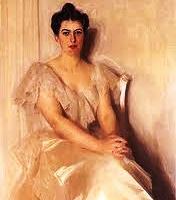 The President of the United States, Grover Cleveland, 49, married his own ward, Frances Folsom, 21, the young girl he helped raise. It took place on June 2, 1886 in the Blue Room of the White House. It was the only presidential wedding to ever take place in the executive mansion. Nothing like it happened before or since. A past scandal in Cleveland's life had already been exposed in the contentious presidential election of 1884. He and several law partners had shared the amorous favors of the same woman. When she became pregnant, Cleveland, the only bachelor among the lawyers, stepped forward to pay the child support and assume responsibility. Now, years later, Cleveland was to be married to his own ward. He was understandably sensitive to how the nation would see the relationship. John Phillips Sousa, the famous director of the Marine Band, helped plan the music for the wedding. He submitted a quartette that he, himself, had composed, entitled "Student of Love." The president carefully studied the piece and then changed the program, crossing out "Student of Love" and substituting the one word, "Quartette." The President was not affectionate to his bride during the wedding ceremony and did not even kiss her at the end. Mother and daughter embraced and wept together before the President whisked her off to a honeymoon. But whatever misgivings the president feared, the nation soon embraced the first couple. The Cleveland's lost re-election, with Frances telling the staff that they would be back. Indeed, Grover Cleveland was the only president to be re-elected after losing the White House. This time they returned with a baby. Ruth Cleveland was beloved by the nation who dubbed her "Baby Ruth." When she died of diphtheria at age twelve, the nation went into mourning. Shortly after the Curtis Candy Company issued a "Baby Ruth" candy bar which was greeted with howls of outrage over the perceived commercialization of the Cleveland family. The company insisted that it was unrelated to the name of the president's daughter. Two more children were born to the Cleveland's including Esther, who became the first child of a president to be born in the White House. She would later be married in Westminster Abbey.